Nepal, a sovereign Independent Kingdom, lies between 80 degree 12′ east longitude and 26 degree 22′ and 30 degree 27′ north latitude. It is bounded on the north by the Tibet Autonomous Region of the People’s Republic of China; on the east by Sikkim and West Bengal of the Indian Union on the south by Indian States of Bihar and Uttar Pradesh and on the west by Uttar Pradesh of Indian Union. The length of the Kingdom is 885 kilometers east-west and its breath varies from 145 to 241 kilometers north-south. Climatically, it lies in the temperate zone with the added advantage of altitude. Himalayan Region: The altitude of this region ranges between 4877 meters and 8848 meters with the snow line running around 48848 meters. It includes 8 of the existing 14 summits in the world which exceed an altitude of 8000 meters. They represent. (1) Sagarmatha (Mt. 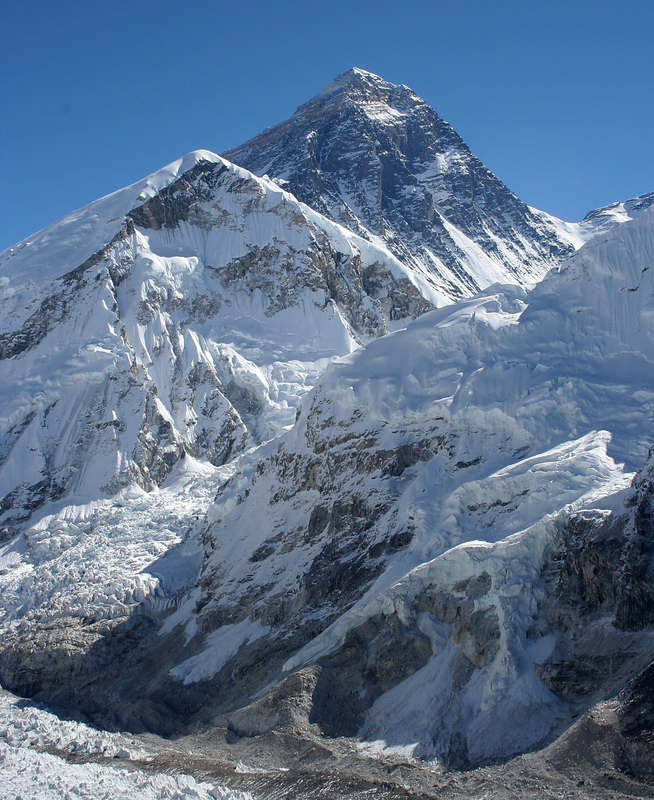 Everest) 8848 m, (2) Kangchenjunga – 8586 m, (3) Lhotse – 8516m, Makalu – 8463m, (5) ChoOyo- 8201 m, (6) Dhaulagiri – 8167m, (7) Manaslu – 8163m, and Annapurna- 8091 m.
Mountain Region: This region accounts for about 64 percent to total land area. It is formed by the Mahabharat range that soars upto 4877 meters. Altitude varies from 610 meters to 1524 meters. Terai Region: The low-land Terai region which has a width of about 26 to 32 kilometers and a maximum altitude of 305 meters, which occupies about 17% of total land area of the country. Traveling by road : All visitors entering Nepal by land must use no other entry points other than (1) Kakarbhitta (2) Birgunj (3) Belhiya, Bhairahawa (4) Nepalgunj (5) Dhangadi (6) Mahendra Nagar in the Nepal. Traveling by air: You can fly directly to Kathmandu from London , Paris , Frankfurt , Vienna , Amsterdam , Moscow , Osaka , Shanghai , Bangkok , Hongkong, Sharjah, Dubai , Dhaka , Karachi , Abu Dhabi , Bahrain , Doha , Paro, Lhasa , Singapore , Delhi , Mumbai, Patna , Calcutta , and Varanasi . Airlines in Nepal: Nepal Airlines, Thai Airways, Qatar Airways, Indian Airlines, Pakistan International Airlines, Biman Bangladesh , Gulf Air, Indian Airlines, Air Sahara , Jet Airways, Austrian Air, Martinair, Air China , Druk Air fly to Nepal regularly. Telephone Services : Telephone, fax, telex and telegraph services are available at the Nepal Telecommunications Corporation at Tripureshwar. Hotels and private communications centers provide long distance telephone. For calling from outside, country code for Nepal is 977 and the area code for Kathmandu is 01. Nepal has a typical monsoonal two – season a year. There is a dry season from October to May and there is the wet season, the monsoon, from June to September. Prevention, the best medicine: Care in what you eat and drink is the most important health rule. The number one rule is don’t consume the water including ice. Reputable brands of bottled water or soft drinks are generally fine. Take care with fruit juice, particularly if water may have been added. Nepal has numerous cultural practices that may appear unusual to a person on his/her first visit to the country. However, to enjoy your stay in this remarkable country of white Himalayas and sparkling rivers it is important to take into consideration the different cultural aspects of the country. Export: It is illegal to export objects over 100 years old (sacred images, paintings, manuscripts OR CALLED ANTIQUE) that are valued for culture and religious reasons. Visitors are advised not to purchase such items as they are Nepal ’s cultural heritage and belong here. Airport tax: Passengers departing from the Tribhuvan International Airport Kathmandu (TIA) are required to pay an airport tax of NRs. 791.00 if going to SAARC countries ( Bangladesh , Bhutan . India , Maldives , Pakistan and Sri Lanka ) and Rs.1130.00 to all other international destinations. Domestic airport tax is Rs. 170.00 for all nationals including Nepalese. Tourism Service Tax: All Travellers other than Nepalese are required to pay NRS. 565.00 at the airport at the time of departure. The population of Nepal was recorded to be about 25 million as of July 2002. Eighty-six percent of Nepalis follow Hinduism, while eight percent follow Buddhism and three percent follow Islam. The population comprises various groups of different races which are further divided into different castes. Some of the main groups are: Gurungs and Magars who live mainly in the western region; Rais, Limbus and Sunwars who live in the eastern mid hills; Sherpas, Manangpas and Lopas who live near the mountains of Everest, Annapurna and Mustang respectively; Newars who live in and around the capital valley of Kathmandu; Tharus, Yadavas, Satar, Rajvanshis and Dhimals who live in the Terai region; and Brahmins, Chhetris and Thakuris generally spread over all parts of the country. Within this spectacular geography is also one of the richest cultural landscapes anywhere. The country is a potpourri of ethnic groups and sub-groups who speak over 93 languages and dialects. Nepal offers an astonishing diversity of sightseeing attractions and adventure opportunities found nowhere else on earth. And you can join in the numerous annual festivals that are celebrated throughout the year in traditional style highlighting enduring customs and beliefs. Land of non-stop festivals etc are explicit and self-explanatory. They tell the world about our incomparable & prosperous cultural heritage.